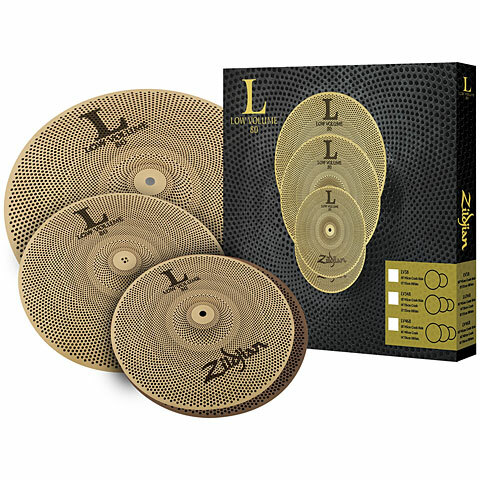 The unique L80 Low Volume Cymbals from Zildjian are up to 80% quieter than normal drum cymbals. Thanks to innovative technologies, these cymbals sound very real without losing the authentic feeling of playing. They are ideal for practice rooms, drum lessons, quiet club performances or wherever you must play quietly. The L80 Low Volume Cymbal series are available both as a set or individually. - 70% - 80% quieter than conventional cymbals, so you can play longer without hearing protection. - Ideal for at home, practice rooms, dormitories or any "noise-sensitive" premises. - Advanced technology and matching alloy ensure a real cymbal feel. - Unique matte finish with a sophisticated look. 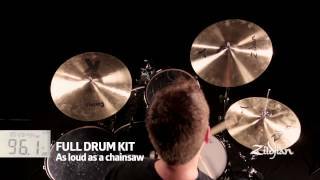 - As with all other Zildjian Cymbals, made in Norwell, Massachusetts in the U. S. A.
the item has been excellent then I expected. Kiss your silencers goodbye and enjoy the deep tones that although muted do not sound like it. My toddler likes to try to play on my kit and even her clanging is bearable with these brilliant cymbals. Moreover, this was the cheapest price for readily available Zildjian L80's in Europe when I was looking for them. This item was given an average rating of 5 out of 5 stars. In total, 2 reviews were submitted. The comments are not the opinion of Musik Produktiv, they are the subjective opinions of our customers. 1 rating exist without a text or the review is written in another language.